We went to a fistfight and a hockey game happened by accident. Man, what an ugly game. OK, it’s farm league. AAA, or the Minors, or whatever the puck slappers call it. The Juniors. AHL, actually. So maybe you don’t expect too much in the way of quality precision play, but you have a good time. And we did. And the brand new Allentown PA PPL arena is one of those just right buildings, the perfect size for a minor league hockey team. It holds maybe 9,000 folks. And it’s right downtown. Cross the street, in the front door, up the escalator, walk across the lobby and into the arena, and your seats are right there. Plenty of bathrooms and plenty of vendor points for food, drinks, and stuff. Plus a Tim Horton’s right inside. Public parking garage just a block away, $6 for the evening. But just a quick 3 blocks from the arena is another parking garage, same price, which is perfectly situated for a fast escape, even if you’ve been drinking if you don’t know the area. Leave the garage, turn left. And 8 blocks later you’re at the highway. Could not be easier. But man, what an ugly game. We had seats almost right behind and a bit above the goal, so we got to see all the slams into the glass behind the net and all the dirty stuff that goes on back there. It was awesome. Goal seats are the best for hockey. 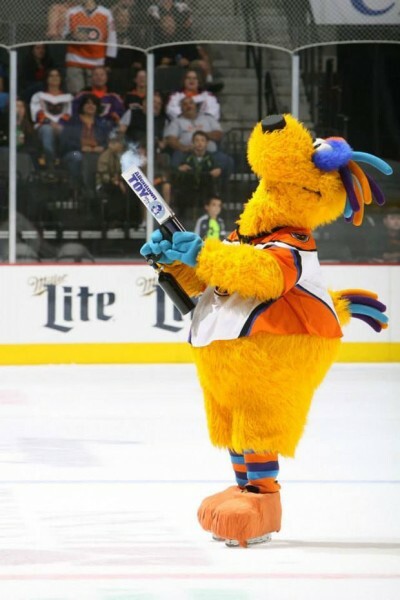 Phantoms mascot Melvin fires up the crowd with his t-shirt gun. It’s PA, so open carry is fine.